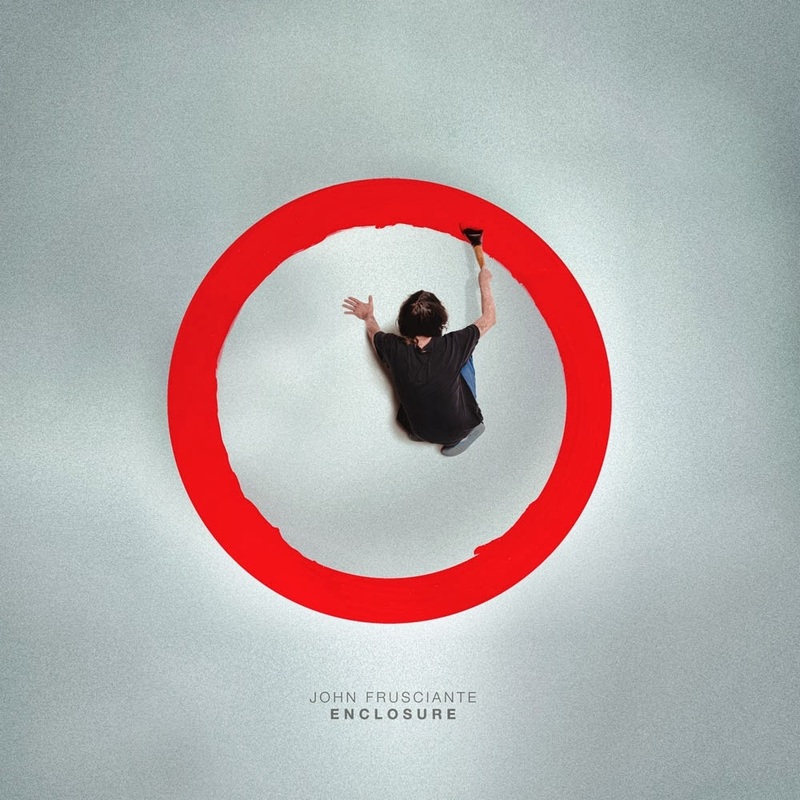 John Frusciante has carved out a niche for himself since his departure from the Red Hot Chili Peppers, and has reportedly been interested in moving into electronic music. I’ve not heard anything else he’s tried post RHCP, but Enclosure certainly marries his vocals and guitar work with a big helping of electronic instruments and effects. What results from this experiment can be rather challenging at times. It took me two run-throughs to start to discern patterns, likes and dislikes. I wrote more than once in my notes during my first listen: “What just happened?” Hopefully I’ll be able to help clarify to the Me of the past, and to the rest of you. While Enclosure is not absolute chaos, it sometimes seems like it’s in conflict with itself, and once in a while it certainly feels like you’ve accidentally started two different songs playing at the same time. When the various layers complement each other you get to hear some rather rare combinations, like Frusciante‘s self-duet in ‘Sleep’; despite its overpowered vocals, its combination of electronic harmony, voice samples, and distortions work very well together. But then you’ll get a song like ‘Run’, with too much start-stop tempo, and unconvincing vocals that knit too closely to the accompaniment. Despite its charming chip-tune blurbles and big organ, ‘Run’ is a mess. And even within a given track you might like, you’ll probably find one thing that you wish wasn’t there or toned down, or at least synched up properly to go alongside everything else– while not always wishing these touches would go away. It may reflect on my utterly boring soul, but when Enclosure is a bit more straightforward it seems to do a bit better; too many levels to a track, and I find myself wishing for a simpler mix. ‘Scratch’ does well for pretty much the whole track, but there’s a strange percussive flurry that splatters over the top of the bass guitar, seeming to cut out an audio channel as it undermines the groove. Maybe its intrusion is the point, I’m not sure how interesting the song would be without this extra noise, but I’m not really sure it quite works in concert with the rest. And the otherwise excellent starter ‘Shining Desert’ has swooping electronic notes, snare, stints of electric guitar, voice sample beats, and Alice in Chains-style vocals– while I liked the individual layers, all of it together felt like one layer too many, with the vocals feeling buried. This isn’t to say this complexity always falls apart: The crazy break beat in ‘Stage’ works really well with the melancholy electronic bass line and the el-guitar; the acid rock ‘Vesiou’ is probably the closest the album comes to conventional, still integrating sped-up, ricocheting voice samples and synth organ harmony into the distorted guitar;‘Crowded’is arguably similar to‘Scratch’ in its sudden-interruption philosophy, but winds up being much more successful when its crazy snare beat jumps in, coming across as quirky, yet fully in control; its follow-up ‘Excuses’ is a kitchen sink of approaches which don’t tangle each other up; and the accessible ‘Zone’ takes a lot of tonal shifts but still is a cool song to experience. “What just happened?” I’d asked myself more than once. After pretty much three full listens I’m still not entirely sure. Frusciante‘s guitar work is the most confident element, and his vocals, while not altogether reliable or varied, possess a good range when allowed, and help keep the disparate song techniques tied together. The electronic component, and some of the percussion, is sometimes all over the place, from the most charming aspect to an unwelcome guest. If you gamble on this album, the first time it may seem just as insane to you as it did to me– in that case you might want to give it another go once you know what to expect. But yeah, even within individual songs its methods are eclectic. I can’t say I’m in love with Enclosure, but after all the places it took me I certainly respect it. John Frusciante Website. Twitter. Facebook. Posted in reviewsTagged Enclosure, John FruscianteBookmark the permalink.